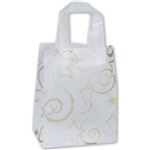 Frosted Bags Mini - Zebra Nuevo 100 Bags/Case - 5" x 3" x 7"
Strong 4 mil frosty bags are reusable. 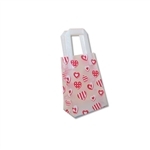 All bags come with reinforced handles and cardboard bottom inserts for added stability. 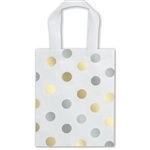 Bag Size (width x gusset x height) 5" x 3" x 7"
The Perfect Loot Bag Size! Frosted Bags Mini - Floral Sketch Black 100 Bags/Case - 5" x 3" x 7"
Frosted Bags Mini - Floral Sketch White 100 Bags/Case - 5" x 3" x 7"
Frosted Bags Mini - Party Balloons 100 Bags/Case - 5" x 3" x 7"
Frosted Bags Petite - Zebra Nuevo 100 Bags/Case - 8" x 4" x 10"
Strong 4 mil frosty bags are reusable. 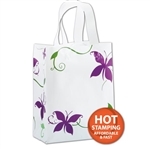 All bags come with reinforced handles and cardboard bottom inserts for added stability. Bag Size (width x gusset x height) 8" x 4" x 10"
Frosted Bags Petite - FB-1071-Floral Sketch Black 100 Bags/Case - 8" x 4" x 10"
Frosted Bags Petite - Floral Sketch White 100 Bags/Case - 8" x 4" x 10"
Frosted Bags Petite - Party Balloons 100 Bags/Case - 8" x 4" x 10"